This example shows how to construct an automated parking valet system. In this example, you learn about tools and techniques in support of path planning, trajectory generation, and vehicle control. While this example focuses on a MATLAB®-oriented workflow, these tools are also available in Simulink®. For a Simulink® version of this example, see Automated Parking Valet in Simulink. On-board sensors are used to perceive the environment around the vehicle. The perceived environment includes an understanding of road markings to interpret road rules and infer drivable regions, recognition of obstacles, and detection of available parking spots. As the vehicle sensors perceive the world, the vehicle must plan a path through the environment towards a free parking spot and execute a sequence of control actions needed to drive to it. While doing so, it must respond to dynamic changes in the environment, such as pedestrians crossing its path, and readjust its plan. This example implements a subset of features required to implement such a system. It focuses on planning a feasible path through the environment, and executing the actions needed to traverse the path. Map creation and dynamic obstacle avoidance are excluded from this example. The environment model represents a map of the environment. For a parking valet system, this map includes available and occupied parking spots, road markings, and obstacles such as pedestrians or other vehicles. Occupancy maps are a common representation for this form of environment model. Such a map is typically built using Simultaneous Localization and Mapping (SLAM) by integrating observations from lidar and camera sensors. This example concentrates on a simpler scenario, where a map is already provided, for example, by a vehicle-to-infrastructure (V2X) system or a camera overlooking the entire parking space. It uses a static map of a parking lot and assumes that the self-localization of the vehicle is accurate. The parking lot example used in this example is composed of three occupancy grid layers. Stationary obstacles: This layer contains stationary obstacles like walls, barriers, and bounds of the parking lot. Road markings: This layer contains occupancy information pertaining to road markings, including road markings for parking spaces. Parked cars: This layer contains information about which parking spots are already occupied. Each map layer contains different kinds of obstacles that represent different levels of danger for a car navigating through it. With this structure, each layer can be handled, updated, and maintained independently. Load and display the three map layers. In each layer, dark cells represent occupied cells, and light cells represent free cells. For simplicity, combine the three layers into a single costmap. The combined costmap is a vehicleCostmap object, which represents the vehicle environment as a 2-D occupancy grid. Each grid in the cell has values between 0 and 1, representing the cost of navigating through the cell. Obstacles have a higher cost, while free space has a lower cost. A cell is considered an obstacle if its cost is higher than the OccupiedThreshold property, and free if its cost is lower than the FreeThreshold property. The costmap covers the entire 75m-by-50m parking lot area, divided into 0.5m-by-0.5m square cells. Create a vehicleDimensions object for storing the dimensions of the vehicle that will park automatically. Also define the maximum steering angle of the vehicle. This value determines the limits on the turning radius during motion planning and control. Update the VehicleDimensions property of the costmap collision checker with the dimensions of the vehicle to park. This setting adjusts the extent of the inflation in the map around obstacles to correspond to the size of the vehicle being parked, ensuring that collision-free paths can be found through the parking lot. Define the starting pose of the vehicle. The pose is obtained through localization, which is left out of this example for simplicity. The vehicle pose is specified as , in world coordinates. represents the position of the center of the vehicle's rear axle in world coordinate system. represents the orientation of the vehicle with respect to world X axis. For more details, see Coordinate Systems in Automated Driving Toolbox. Localization: The behavioral layer inspects the localization module for an estimate of the current location of the vehicle. Environment model: Perception and sensor fusion systems report a map of the environment around the vehicle. 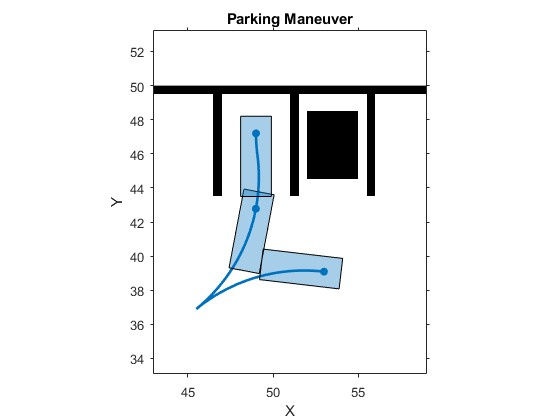 Determining a parking spot: The behavioral layer analyzes the map to determine the closest available parking spot. Finding a global route: A routing module calculates a global route through the road network obtained either from a mapping service or from a V2X infrastructure. Decomposing the global route as a series of road links allows the trajectory for each link to be planned differently. For example, the final parking maneuver requires a different speed profile than the approach to the parking spot. In a more general setting, this becomes crucial for navigating through streets that involve different speed limits, numbers of lanes, and road signs. Rather than rely on vehicle sensors to build a map of the environment, this example uses a map that comes from a smart parking lot via V2X communication. For simplicity, assume that the map is in the form of an occupancy grid, with road links and locations of available parking spots provided by V2X. The HelperBehavioralPlanner class mimics an interface of a behavioral planning layer. The HelperBehavioralPlanner is created using the map and the global route plan. This example uses a static global route plan stored in a MATLAB table, but typically a routing algorithm provided by the local parking infrastructure or a mapping service determines this plan. The global route plan is described as a sequence of lane segments to traverse to reach a parking spot. Load the MAT-file containing a route plan that is stored in a table. The table has three variables: StartPose, EndPose, and Attributes. StartPose and EndPose specify the start and end poses of the segment, expressed as . Attributes specifies properties of the segment such as the speed limit. Plot a vehicle at the current pose, and along each goal in the route plan. Create the behavioral planner helper object. The requestManeuver method requests a stream of navigation tasks from the behavioral planner until the destination is reached. Path Smoothing: Smooth the reference path by fitting splines to it using smoothPathSpline. Trajectory Generation: Convert the smoothed path into a trajectory by generating a speed profile using HelperSpeedProfileGenerator. 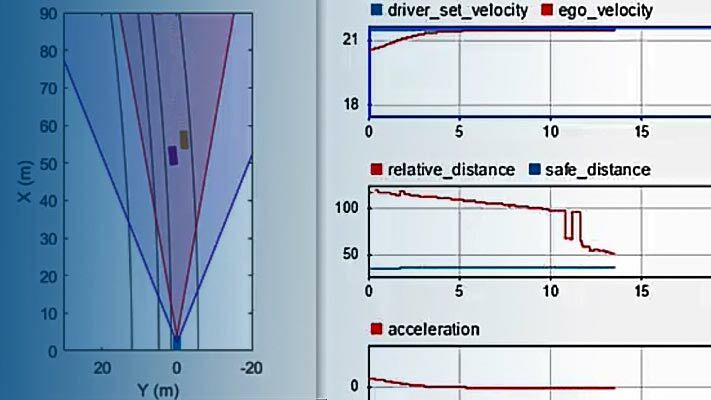 Vehicle Control: Given the smoothed reference path, HelperPathAnalyzer calculates the reference pose and velocity based on the current pose and velocity of the vehicle. Provided with the reference values, lateralControllerStanley computes the steering angle to control the heading of the vehicle. HelperLongitudinalController computes the acceleration and deceleration commands to maintain the desired vehicle velocity. The rest of this example describes these steps in detail, before assembling them into a complete solution. Given a global route, motion planning can be used to plan a path through the environment to reach each intermediate waypoint, until the vehicle reaches the final destination. The planned path for each link must be feasible and collision-free. A feasible path is one that can be realized by the vehicle given the motion and dynamic constraints imposed on it. A parking valet system involves low velocities and low accelerations. This allows us to safely ignore dynamic constraints arising from inertial effects. 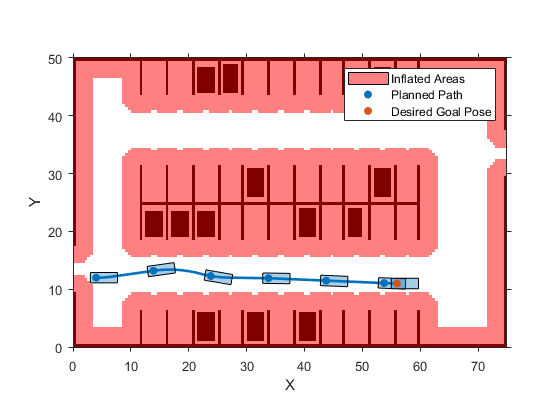 Create a pathPlannerRRT object to configure a path planner using an optimal rapidly exploring random tree (RRT*) approach. The RRT family of planning algorithms find a path by constructing a tree of connected, collision-free vehicle poses. Poses are connected using Dubins or Reeds-Shepp steering, ensuring that the generated path is kinematically feasible. Plan a path from the current pose to the first goal by using the plan function. The returned driving.Path object, refPath, is a feasible and collision-free reference path. The reference path consists of a sequence of path segments. Each path segment describes the set of Dubins or Reeds-Shepp maneuvers used to connect to the next segment. Inspect the path segments. The reference path contains transition poses along the way, representing points along the path corresponding to a transition from one maneuver to the next. They can also represent changes in direction, for example, from forward to reverse motion along a Reeds-Shepp path. Retrieve transition poses and directions from the planned path. In addition to the planned reference path, notice the red areas on the plot. These areas represent areas of the costmap where the origin of the vehicle (center of the rear axle) must not cross in order to avoid hitting any obstacles. pathPlannerRRT finds paths that avoid obstacles by checking to ensure that vehicle poses generated do not lie on these areas. The reference path generated by the path planner is composed either of Dubins or Reeds-Shepp segments. The curvature at the junctions of two such segments is not continuous and can result in abrupt changes to the steering angle. To avoid such unnatural motion and to ensure passenger comfort, the path needs to be continuously differentiable and therefore smooth . One approach to smoothing a path involves fitting a parametric cubic spline. Spline fitting enables you to generate a smooth path that a controller can execute. Use smoothPathSpline to fit a parametric cubic spline that passes through all the transition points in the reference path. The spline approximately matches the starting and ending directions with the starting and ending heading angle of the vehicle. Next, convert the generated smooth path to a trajectory that can be executed using a speed profile. Compute a speed profile for each path as a sequence of three phases: accelerating to a set maximum speed, maintaining the maximum speed and decelerating to a terminal speed. The HelperSpeedProfileGenerator class generates such a speed profile. Specify initial, maximum, and terminal speeds so that the vehicle starts stationary, accelerates to a speed of 5 meters/second, and comes to a stop. Create a HelperSpeedProfileGenerator object to generate the speed profile based on the smoothed path. 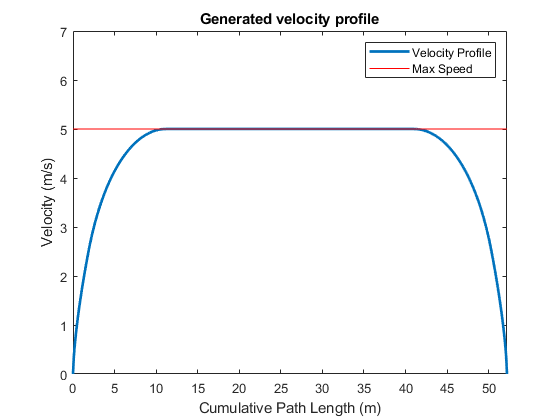 Generate a speed profile based on the cumulative length along the path and the previously specified speeds. refSpeeds contains reference speeds for each point along the smoothed path. Plot the generated speed profile. Lateral control: Adjust the steering angle such that the vehicle follows the reference path. Longitudinal control: While following the reference path, maintain the desired speed by controlling the throttle and the brake. Since this scenario involves slow speeds, you can simplify the controller to take into account only a kinematic model. In this example, lateral control is realized by the lateralControllerStanley function. The longitudinal control is realized by a helper System object™ HelperLongitudinalController, that computes acceleration and deceleration commands based on the Proportional-Integral law. Create a HelperPathAnalyzer object to compute reference pose, reference velocity and driving direction for the controller. Create a HelperLongitudinalController object to control the velocity of the vehicle and specify the sample time. Use the HelperFixedRate object to ensure fixed-rate execution of the feedback controller. Use a control rate to be consistent with the longitudinal controller. Compute steering and acceleration/deceleration commands required to track the planned trajectory. Feed control commands to the simulator. Record the returned vehicle pose and velocity to feed into the controller in the next iteration. This completes the first leg of the route plan and demonstrates each step of the process. The next sections run the simulator for the entire route, which takes the vehicle close to the parking spot, and finally executes a parking maneuver to place the vehicle into the parking spot. Now combine all the previous steps in the planning process and run the simulation for the complete route plan. This process involves incorporating the behavioral planner. % will always be collision-free. Now that the vehicle is near the parking spot, a specialized parking maneuver is used to park the vehicle in the final parking spot. This maneuver requires passing through a narrow corridor flanked by the edges of the parking spot on both ends. Such a maneuver is typically accompanied with ultrasound sensors or laser scanners continuously checking for obstacles. The vehicleCostmap uses inflation-based collision checking. First, visually inspect the current collision checker in use. 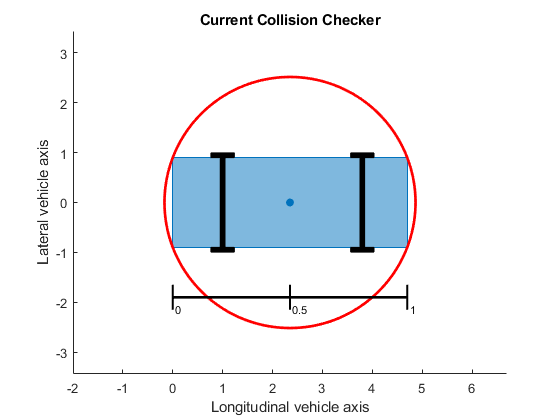 Collision checking is performed by inflating obstacles in the costmap by the inflation radius, and checking whether the center of the circle shown above lies on an inflated grid cell. The final parking maneuver requires a more precise, less conservative collision-checking mechanism. This is commonly solved by representing the shape of the vehicle using multiple (3-5) overlapping circles instead of a single circle. 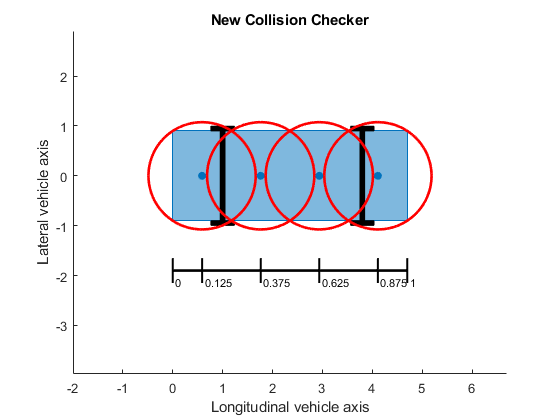 Use a larger number of circles in the collision checker and visually inspect the collision checker. This allows planning through narrow passages. Update the costmap to use this collision checker. Notice that the inflation radius has reduced, allowing the planner to find an unobstructed path to the parking spot. Once the maneuver is found, repeat the previous process to determine a complete plan: smooth the path, generate a speed profile and follow the trajectory using the feedback controller. An alternative way to park the vehicle is to back into the parking spot. 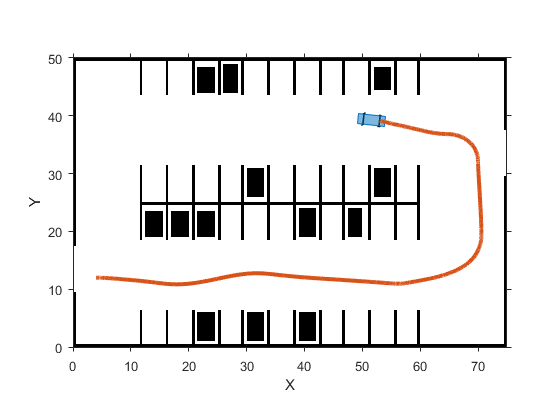 When the vehicle needs to back up into a spot, the motion planner needs to use the Reeds-Shepp connection method to search for a feasible path. The Reeds-Shepp connection allows for reverse motions during planning. To find a feasible path, the motion planner needs to be adjusted. Use a larger turning radius and connection distance to allow for a smooth back-in. The path corresponding to the parking maneuver is small and requires precise maneuvering. Instead of interpolating only at transition poses, interpolate more finely along the length of the path. % Find the reference pose on the path and the corresponding velocity. % driving direction, reset and return the current vehicle velocity as zero. Plan a feasible path in a semi-structured environment, such as a parking lot, using an RRT* path planning algorithm. Smooth the path using splines and generate a speed profile along the smoothed path. Control the vehicle to follow the reference path at the desired speed. 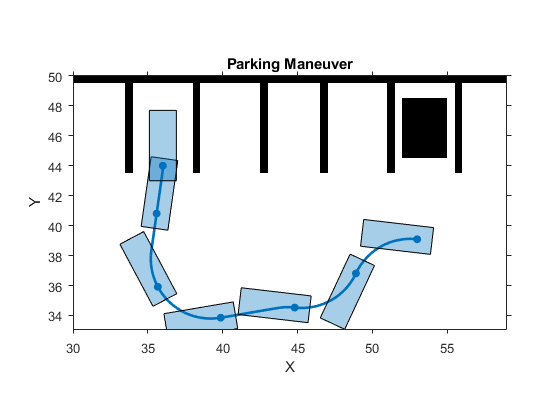 Realize different parking behavior by using different motion planner settings. Lepetic, Marko, Gregor Klancar, Igor Skrjanc, Drago Matko, Bostjan Potocnik, "Time Optimal Path Planning Considering Acceleration Limits." Robotics and Autonomous Systems. Volume 45, Issues 3-4, 2003, pp. 199-210. %   markings, and used spots. %   Plot the multiple map layers on a figure window. %   Combine map layers struct into a single vehicleCostmap. % Plot the generated parking maneuver on a costmap.